Axas Class M HDTV Linux Satellite Receiver. 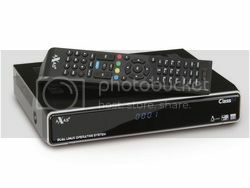 The Axas Class M is a full HD digital satellite receiver with PVR function hybrid and media player all in one. The receiver comes with a Linux OS and E2 HD is also dual boot capable. This makes it possible to install a second operating system and easily switch between the two systems. The TimeShift function, in conjunction with a connected USB storage timeshifting and with the integrated browser, access to the favorite websites possible. In addition, the Axas Class M also supports interactive applications as well as watching YouTube videos and listening to Internet radio stations. The connection can be wired or wireless (requires optional Wireless LAN drive) take place. Thanks to the media player function also has multimedia playback (MKV. AVI, MPG, MP4, TS, WMA, MP3 and more) is possible.